JACKSON & RICKSON (A Division of Healthcare Pharma) is an ISO 9001 : 2008 Certified Company which is COMMITTED TO EXCELLENCE AND INNOVATION in entire Healthcare Sector. The Company has been established to be the best healthcare company in the segment of providing economical medicines to serve humanity. The origin of our company is laid in Roorkee a very popular city of Indian Sate,Uttarakhand respectively. 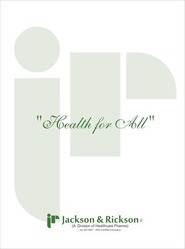 Purpose To be a leader in the Health Care industry by providing enhanced services, relationship and mankind. Mission statement To build long term relationships with our customers and clients and provide exceptional customer services by providing best healthcare products which can be affordable to anyone & everyone. Core values• We believe in treating our customers with respect and faith• We grow through creativity, invention and innovation.• We integrate honesty, integrity and business ethics into all aspects of our business functioning.All in all we believe in Providing " HEALTH FOR ALL "